Are Schools Pushing Girls Away from Science? Women and underrepresented minorities who have successfully pursued STEM careers were discouraged along the way, according to a report released this week. What's more, those who experienced discouragement in their lives most often cited their educational institutions as the offenders. But they also cited "inspiring and dedicated teachers" as positive influences in their career decisions. 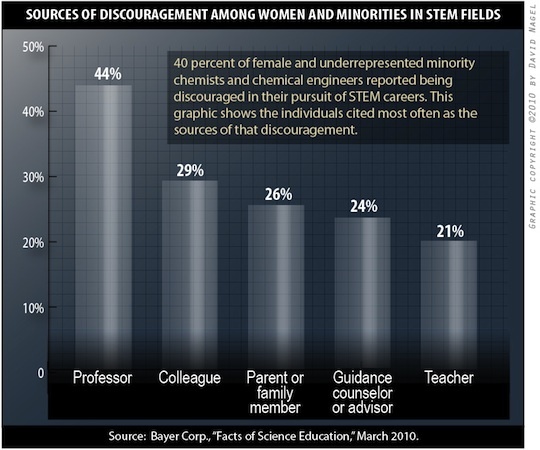 The report, "Facts of Science Education XIV," conducted by research firm Campos and commissioned by pharmaceutical maker Bayer, surveyed 1,226 "female and underrepresented minority" members of the American Chemical Society, specifically chemists and chemical engineers--mostly those who had attained doctoral degrees (64 percent), but also those with bachelor's (20 percent) and master's degrees (16 percent). What the report found was that a significant portion of those surveyed said they believed they'd been discouraged from pursuing careers in science. Forty percent said that they personally had been "discouraged by individuals during the course of their successful pursuit of a STEM career." Hispanic women indicated that they had fared worse than average, with 50 percent reporting that they had been discouraged--the same figure reported by black men. Asian women reported the lowest amount of discouragement among the statistics cited in the report, at 28 percent, followed by Hispanic men, at 31 percent. So where is this discouragement happening? 35 percent have experienced it in the workplace. Who were the worst offenders? College professors, according to the report, with 44 percent of respondents citing those individuals as a source of discouragement. That figure jumped up to high of 65 percent among black women and fell down to a low of 28 percent among Asian women. Colleagues, family members, advisors, and teachers were also cited--although teachers and family members were strongly reported as positive factors as well. The chart below shows a breakdown of the culprits, with those in a position of trust in educational institutions cited most frequently. Guidance counselors were cited more often as offenders by black men (34 percent), Hispanic women (31 percent), and black women (30 percent). A lack of solid math and science education in poorer schools (24 percent). "If we want to achieve true diversity in America's STEM workforce, we must first understand the root causes of underrepresentation and the ongoing challenges these groups face," said Greg Babe, president and CEO of Bayer, in a statement released Monday. "We want to knock down barriers. If we can do that, we'll be able to develop the attitudes, behaviors, opportunities and resources that lead to success." So what were the positive influences for these respondents? The vast majority (82 percent) credited a "strong personal interest" in science as one of the factors leading them to a career in STEM. More than three-quarters of respondents (77 percent) said they thought the STEM workforce in the United States is lacking women and underrepresented minorities owing to a lack of early encouragement and nurturing. However, managerial bias in STEM companies is still a significant factor, according to 40 percent of respondents, as is institutional bias (38 percent). The report had a margin of error of ±3 percent at a 95 percent confidence level. Further information about the survey can be found on Bayer's site here.